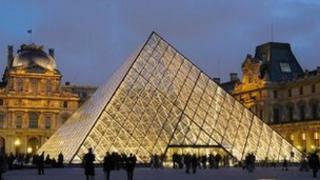 The Louvre in Paris has topped the list of the most visited art museums of 2012, according to the Art Newspaper. The publication's annual survey found 9.7 million people visited the French institute - one million more than 2011. New York's Metropolitan Museum of Art was the second most-visited venue, with three London museums taking the third, fourth and fifth spots. The most popular exhibition of the year was a show of Dutch Old Masters at Tokyo's Metropolitan Art Museum. Masterpieces from the Mauritshuis, which included Vermeer's 1665 painting Girl with a Pearl Earring, brought 10,500 visitors a day to the Tokyo gallery between June and September 2012. Visitor numbers at the Louvre, which has topped the annual list of most popular venues since it began in 2007, were boosted by the museum's new wing of Islamic art. While the position of the top 10 venues showed little change on the previous year, British museums had an "excellent" 2012 according to the survey, boosted by increased visitors to London for the summer Olympics. Tate Modern, which attracted a large number visitors thanks to a Damien Hirst retrospective and the Tanks installation, moved up a place to fourth on the list with 5.3 million visitors - up from 4.8 million in 2011. The shifting patterns of museum visiting reflect the changing world order. Brazil and China both feature in the international top 20 most visited exhibitions list. That wouldn't have been the case a few years ago when Europe and America dominated. And with the Louvre and Guggenheim due to open branches in Abu Dhabi, Mexico's hatching of ambitious plans, and the rapid emergence of India as a major museum player, the league table of global exhibition powerhouses is likely to change further in the coming years. It will be the world's big conurbations that will rise to the top, either through nation states building and/or modernising their museums, or increasingly, corporations with a keen eye for art and a nose for brand-building taking the lead. The Bank of Brasil is behind the South American country's recent exhibition successes, and the Korean electronics firm Samsung has built an extremely impressive museum complex in Seoul. Alex Beard, deputy director at the Tate said its versatile offering helped bring more people to the gallery. "It has been an extraordinary year at Tate Modern, opening the world's first museum galleries permanently dedicated to exhibiting live art, performance, installation and film works alongside an outstanding exhibition programme which has undoubtedly fuelled the increase in visitors," he said. While Rio's Centro Cultural Banco do Brasil appeared three times with The Amazon: Cycles of Modernity in second place with 7,928 daily visitors, Antony Gormley's Still Being, at seven with 6,909 daily visitors and India at 11 with 6,347 daily visitors. Due to its popularity, the gallery extended its opening hours for the show's final week, opening until midnight on weekdays. Meanwhile, in the Art Newspaper's list of top 10 London venues, Leonardo at the National Gallery was the highest ranking show to feature pre-20th Century works, with 3,985 visitors a day.